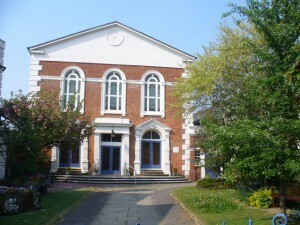 The Dorking Congregational Church was founded in 1662 during the reign of Charles II, when by an Act of Parliament, all those clergy who refused to conform to all the doctrines and practices of the Anglican Church were ejected from that church and founded a denomination of their own. From 1662 until 1691 and 1695 respectively, worshipers met at the houses of the Rev’d James Fisher of Fetcham and Rev’d John Wood from North Chapel Sussex. In 1695 under the leadership of Rev’d Samuel Brookes, they met in a barn on Butter Hill, opposite the “Friends Meeting House”. The building we worship in today was erected in 1834. A building was erected on this site in West Street in 1719 to accommodate the growing congregations. This served until 1834, when the present church was built. Since then, many alterations and additions have been made.In the early years, the church was known as the “Meeting House” and then as the “Independent Chapel”. In the early 1900’s the name “Congregational Chapel” came into use. This was gradually changed to the “Congregational Church”. In 1972 further history was made when the Congregational Church in England and Wales joined with the Presbyterian Church of England to form the United Reformed Church.